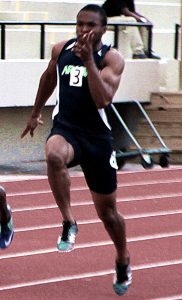 The Arabia Mountain Rams captured six gold medals on the way to the Region 5-5A Boys Track and Field Championship 144-132 over Chamblee at Godfrey Stadium. The tandem of Tyler Jones and Michael Willingham accounted for four of the gold medals with two each in the field events. Jones swept the long jump (23-01.00) and the triple jump (45-03.00) titles to get the Rams rolling on the first day of competition. Willingham swept the throws with a victory in the shot put (48-11.00) and the discus (173-01.00). The track finals added two more gold medals for the Rams as Berhane Johnson brought home the 110 meter hurdles (14.91) title and the 4×100 meter relay team of Travian Hall, Priest Foust, Berhane Johnson and Tyler Jones ran a time of 41.66 to take the win in a tight race with Southwest DeKalb (41.71). Chamblee’s second place finish was fueled by a sweep of the distance events by freshman Andrew Rogers. Rogers took the 1600 meter run in 4:42.04 just ahead of Clarkston’s Rukundo Uwimana (4:42.49) and the 800 meter run in 2:012.02 just in front of Miller Grove’s TiRell Courtney (2:01.56). Will West contributed 26 points to the Chamblee cause with a win in the pole vault (6-10.00) and took second in both the 110 meter hurdles (14.92) and the 300 meter hurdles (40.30). Two-time defending Class 5A state champion Southwest DeKalb (109) finished third in the standings despite bringing home four gold medals. Terryon Conwell won the 100 meter dash (10.87) and was second in the 200 meter dash (21.82) while his brother Terry captured both the 200 meter (21.54) and 400 meter (48.99) dashes. The 4×400 meter relay team of Marcellus Boykin, Devin Brewington, Terry Conwell and Terryon Conwell racked up the gold with a time of 3:22.48. Fourth place Clarkston (93) picked up a pair of gold medals as Bineyam Tumbo won the 3200 meter run (10:09.33) and Jarshun McNeil won the high jump (6-00.00). Miller Grove’s Fereday Chipere finished atop the 300 meter hurdles with a time of 39.42 to lead the Wolverines into fifth place with 75 points. The Miller Grove Lady Wolverines overcame a strong push by the Arabia Mountain Lady Rams to pull out a 171-156 Region 5-5A Track and Field Championship victory at Godfrey Stadium. Miller Grove grabbed four gold medals, but the depth provided eight silver medals to overcome the eight first place finishes by the Lady Rams. Miller Grove got a pair of gold medals from Emoni Coleman in the 800 meter (2:19.03) and the 1600 meter (5:23.24) runs. Zariah Kitchens won the 400 meter dash (56.17) and Marquerite McGill took top honors in the shot put (34-11.25). Jakeeyah Seymour put together three silver medal finishes for Miller Grove including the 100 (14.96) and 300 (46.23) meter hurdles and the triple jump (36-02.50). Tacari Demery added two more silver medals with her performances in the 100 (12.46) and 200 (25.35) meter dashes. Lauryn Griggs added a silver in the 800 meter run (2:25.91) and both the 4×100 meter (47.69) and 4×400 meter (3:55.60) came in second. Arabia Mountain won a pair of gold medals in the field events as Patra Williams won the high jump (5-04.00) and Samaria Allen won the long jump (17-05.00). Mikayla Jordan came up big on the track winning both the 100 (12.14) and the 200 (24.26) meter dashes while Destinee Rocker swept the 100 (14.33) and 300 (46.17) meter hurdles. The final two gold medals for the Lady Rams came in the 4×100 meter relay and 4×400 meter relay. The team of Queen Dais, Destiny Walker, Mya Willingham and Makayla Jordan won the 4×100 in 47.58. Allen joined Dais, Walker and Jordan in the 4×400 to run a time of 3:52.95 to finish atop the podium. Chamblee’s third place (110) was led by gold medals by Xiao Beining in the 3200 meter run (11:37.83), Rachel Edler in the triple jump (38-01.00) and Oni Tunson in the discus (106-02.50). All top four finishers at the region track meet advance to the Class 5A State Sectional at Eagle’s Landing on Saturday (April 29). The 1600 meter run and field events start at 10:30 am with the running events set for 3:30 pm. The Druid Hills Lady Red Devils finished third and the Red Devils finished fifth in the Region 4-4A boys’ and girls’ track meet. The Lady Devils picked up 76 points behind a pair of silver medals by Genevieive Ferrara in the 800 meter run (2:29.89) and the 3200 meter run (13:02.33). Amber Austin added a bronze in the 300 meter hurdles (51.48). Ermias Tewolde led the Red Devils with a silver in the 3200 meter run (10:18.58) and a bronze in the 1600 meter run (4:44.59). The 4×400 meter relay team brought home a bronze with a time of 3:25.98. All top four finishers at the region track meet advance to the Class 4A State Sectional at Cross Creek High School in Augusta on Saturday (April 29). The 1600 meter run and field events start at 10:30 am with the running events set for 3:30 pm.